Welcome to the BAICE e-forum, again! Today’s discussions are facilitated by Dr. Sushan Acharya, Associate Professor, Central Department of Education, Tribhuvan University, Nepal. Sushan is an Associate Professor at the Central Department of Education Tribhuvan University (TU), Kirtipur. Sushan has undertaken a number of researches, evaluation, reviews and consultancy projects in the field of education (both formal and non-formal) particularly with focus on gender and social inclusion. For example she was involved in final evaluation of EFA in 2014 and SSRP mid-term evaluation in 2012. 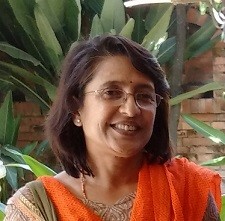 She has published a number of articles in education related areas in national and international publications. Women learners come with different levels of literacy skills to literacy centres. Due to absence of non-formal continuing education opportunities non-literates have no choice than to come to the beginners’ class. Education donors and INGOs do not recognize the importance of adult literacy and non-formal education (NFE) for lifelong learning opportunities for all. Women’s literacy and NFE are obviously not the priority of most NGOs that are primarily operated through donor support. Bureaucrats don’t recognize the potentiality of NFE beyond basic literacy. In this situation research can hardly influence policy and thereby the system. Where and how this situation can be effectively intervened? Non-formal education became part of the international discourse on education policy in the late 1960s and early 1970s. Literally NFE is very popular in any educational conference, seminars and everybody is saying that NFE has potentials to remove illiteracy and poverty. By now there are lot of people who are experts in NFE those educational background is from formal education. It is because there is no institutional structure of NFE to develop human resources e.g. teachers, education managers, researchers, policy makers etc. In the formal education system, there are lots of institutional structure that is providing formal human resources. In this situation, we should think to establish institutional set-up to develop NFE personnel, equivalency system between NFE & Formal education and national level long term programs of NFE to improve literacy and poverty situation. Agreed. thank you Mr. Khan. My post is based on Nepal experience and what you said about the absence of institutional structure for NFE is very true. Researches often indicate that issues and ineffectiveness of NFE programs including women’s literacy are largely caused by the gaps in institutional arrangement. But in my opinion since NFE and adult literacy are the the priority of the Ministry of Education and donor agencies researches couldn’t convince them to recognize the importance of NFE for lifelong learning, particularly for women and disadvantaged population. Thanks, Sushan. Yes, I really recognise the situation you describe here. When I was previously working in Nepal, I noticed that many women attended the same ‘basic’ literacy courses again and again. This was sometimes because they felt they had not learned enough the first time round but also because they wanted continuous learning opportunities (lifelong learning, as you say) rather than a one-off literacy course. It seems this is a situation where policy makers need to see what participants are saying when they repeat literacy courses, rather than the concern that we need to roll out literacy to new and different ‘target groups’. Taking the point of Susan I see the complexity in continuing education is absence of long term planning for adult and continuing education. Usually the programmes are planned on short-term ad hoc basis. There is no systematic process of entry assessment of learners and preparing customized learning plan for them. This is equally true for basic literacy courses and continuing education courses. Besides the planning perspective, joining with Nafiz I would like to reiterate the importance of professional development of adult literacy/learning tutors. The scope of that is seldom there. Had there been such scope the tutors themselves could extend support to the learners to develop their learning plan based on entry assessment (even if they join the same course repeatedly). The recognition of NFE is an issue in many countries; in the UK we have seen annual reductions in funding and support for non-accredited learning in and with communities. Ironically, lots of the impact of such forms of learning, as identified through individual learners’ testimonies, evaluation studies, studies of change and of the social return on investment, indicate how often the first steps to learning as an adult are through non-formal approaches. And these informal steps are taken through a topic, activity or area of interest which motivates the individual to learn. Regardless of how long adults were in school, college or university, they know what interests them and what purposes they seek to fulfil. Of course, these can change over time, but they do not approach learning from a blank sheet but with diverse experiences, knowledge and understanding. However many adults do approach learning with anxiety and fear that their negative or limited experiences of learning, through school, may be repeated or because someone, somewhere has suggested that they are incapable of learning. This is why so many initiatives use motivational opportunities and then embed literacy and numeracy learning, to enhance and enrich the learning and help learners to become more autonomous in determining what they might learn next. However, this sort of approach demands knowledge of what research tells us works, for whom, in what kinds of ways as well as the skills and knowledge which teachers and tutors need. The gap between what researchers have discovered and what happens ‘on the ground’, as well as what policy-makers understand can be huge. Our challenge is to discover ways of ‘bridging’ this gap. What can we do to help all stakeholders to see that research has something to offer to practice and that experience, on the ground, can inform research? Yes Janine i agree to the points you made here. But in order for learners to be ‘autonomous in determining what they might learn next’ I believe there ought be opportunities and/or services available from where they can continue their learning. In my visits i have come across young women, married, completed primary or bit higher level of education, coming to the basic literacy class hoping to continue learning and learning computer, etc. But there is no system or mandate or service either at CLC or another place to address these young women’s needs and aspirations. NGOs not interested or not mandated by their donors to support in this field….. We have been, through research and evaluation raising the same issue repeatedly in writing or through media but those who have purse do not listen. Therefore as Anna said for Nepal we desperately need continuing education system for neo-literates than roll out literacy to another target group. Unless there are opportunities available for continuing education, we experienced that we are not able to create a literate environment… learning society needed to create motivation for lifelong learning. NFE is a form of education that has empowered and can still empower women in the world today. Most of the economic successful women and men in Uganda are those who have gone through non-formal or informal education. My recommendation would be that people have to accept the fact that adults want practical education, and they also prefer serious analysis of what they are doing or what they want to do. Taking a lot of their time on learning to read and write would be a waste of time. Interesting ideas. Thanks. It appears to be a common case that non-formal learning is not able to receive due social and governmental recognition. For instance, in China’s urban areas, it happened that workers, especially when older ones, had to go back to formal educational programmes just to acquire a degree or relevant certificate for further promotion, although they accumulated job experiences. Certificate or degree education as a condition to promote is a convenient way for authorities to control, which also would limit the creativity and vitality of society, let alone waste time and money. So research could consider how to inform policy that find/stipulate equivalence between formal and non/informal learning for the sake of social inclusion. In the Philippines, the government recognizes other forms of education other than formal education. Under the Department of Education, we have the Bureau of Alternative Learning System (BALS). It has two major strands, the Basic Literacy Program (BLP) and the Continuing Education Program –Accreditation and Equivalency (A&E) Program. For BLP we have program for Indigenous Peoples, for Muslim migrants, for differently-abled persons, for adolescents (Adolescent Reproductive Health), for parents (Parent Education), for poor families (Family Basic Literacy), and for disadvantaged children (informal education for disadvantaged children). We also have the Radio-Based Instruction (RBI) which is a form of distance learning so learners get to access education where they through the broadcast of lessons. These programs are flexible and modular, usually community-based and conducted at community learning centers. Although already in place, there are certain dimension of the system which are worth examining. ALS learning facilitators or mobile teachers encounter problems particularly on budget, staffing and learning materials. Much of its financial assistance come from Local Government Units and lack of coordination among LGUs and DepEd is often an issue. Like what Dr. Acharya said, NFE is not a priority of the government/donors. Why is it not possible to increase the budget for NFE? Why can’t we convince the government to consider NFE to be one of its major priorities? There is a great deal of best practices worth documenting in this field but who will do the documentation? Facilitators? Researchers? Both? Or both of them plus the learners? Is there a budget for such collaborations? The government requires setting national standards and quality assurance practices. So, is there a possibility of creating local research units that will systematize and operationalise these types of collaboration? certification for non formal education can only be use to teach at non formal or literacy classes, those even sometime will ask for certification from formal education to access the job market. Non formal education certification can only help in your professional self employment cases. Women and specially girl’s learners may come with different levels of literacy skills as they may have drop schooling for early, forced marriages. They may promise the girl will continue her schooling after the marriage, which is not the case as because of the household division and responsibilities (defined by socialization, tradition and the social attributes associated with being male or female) they may not have time to finish earlier and go to school. Finally in looking to continue their learning they may after 2 or even 7 years start in a non formal education where they have no other option but start as beginners’. yes, in most cases girls/young women restart after 2 or more years. this is why we need a continuous system of education/learning… so that women can start from where they are in terms of their knowledge and skills. Many of them are not motivated to start from the level of input that they don’t need. Yes! The issue of non-formal learning opportunity is missing from research and policy agendas. The impact of absence of non-formal education opportunities on the out-of-school youths and adults, particularly women is not being realized. Bureaucrats, as Dr. Sushan said, do not recognize the potentials of alternative learning options for women. They even argue that non-formal education is not relevant because schools are being constructed in every corners of the country, many teachers are being trained and recruited, primary education is being freely offered, adult literacy classes are also in place…hence, no need to have non-formal educational opportunities. As a result, in some part of our country, alternative basic education centers are being closed. Contrary to this, it is undeniable fact that many women have no access to the formal education due to their productive and reproductive roles and due to cultural reasons. Hence, they should be given other opportunities to continue their education. Distance education could be one option with this regard. Unfortunately same here in Nepal. Bureaucrats are hard to convince about the significance and long term benefit of NFE for educational development and sustainable development. No sooner did I read Dr.Sushan’s question than I remembered the roles of schooling on formal education. Policy makers, practitioners, and NGOs are product of the formal education, schooling. The nature of this education al systems are characterised by bound to curriculum, course structure and bureaucratic administration. It has power to develop in ones mind the baggage of thinking that assumes,non-formal education is not noticeabley important. So, bureaucrats ( the products of formal education) do not value non-formal education. Therefore, the inherent problems are rooted in the experiences of schooling. To effectively intervene this situations, the root cause of negligence of non-formal education need to be considered. Therefore, the question raised by Dr.Sushan, “Where and how this situations can be intervened? ” The research need to focus on:in what way non-formal education be integrated with formal education, roles of schooling in adult literacy and how to prioritize learning to learn in school (to break out of the prison of formal education bastion, which assumes schooling as priding place of learning). Thank you Temesgen. You are absolutely right. Due to their formal education orientation whole system is focused on it. Once a district education officer said that he had 32 tasks related to FE so that he couldn’t give required time and thought to NFE related tasks, (which has no strong institutional base or mandate). With this I would like to thank you all for actively participating in the discussion. Engaging in discussion with you all was very fruitful. Thank you again. The excerpts below are just a few of the many ways how NFE is applied and looked at other countries. In the Philippines, the government plans for both formal, non-formal, there’s even an informal education. As common knowledge, literacy seems to have been associated more with the non-formal and informal. However, it seems they are the more direct forms of raising the poor’s conditions for them to become more productive members of society. Another example below, tells us specifically how literacy affects women’s upliftment and empowerment. And it seems the whole world has joined this trend of thought, forgetting the reality of what is more valuable for the realities in their own country contexts. We have looked at formal education as the more privileged that accessing NFE courses makes one underprivileged. Even governments mindsets have to be changed, as to how they really understand the relevance of formal, non-formal and informal education. I would agree that the ways these three are understood and used is a reflection of a country’s economic, political and socio-cultural milieu. But what matters most here is how governance can mobilise resources to make formal, NFE and informal education relevant to this milieu, even if government has to categorise human resources accordingly. The more important is the aftermath, turnover of the learned to productive resources and earning decently. Thank you Rebecca for valuable information .